In July, CVG will be hanging our Second Annual Student Show and Sale. Please bring a maximum of 2 of your best pieces done at CV in the last year to be a part of this show. They must be professionally presented so either framed and wired for hanging or matted and in plastic sleeve so it can be hung with sticky tape. NO SAWTOOTH HANGERS! Put artist name, class, medium and price (or NFS) on the back. There will be Peoples Choice Awards. Bring your work in to CVG by July 1st. The Open House (and voting) will be July 13 from 10-12noon so bring food to share, along with friends and family to see your work and meet the teachers. Make yourself and your teachers proud!!!! Sometimes emotions can’t be put into words, and when you’re unable to express yourself, it can lead to a lot of pent-up anxiety and stress. Art, however, provides you an outlet without words, allowing you to express and let go of all of your feelings, fears, and insecurities. 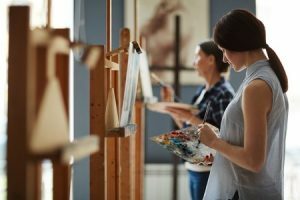 Painting, drawing, and other forms of art will not only release pent-up emotions, but also give you a break from your anxious thoughts. Art forces you to focus on the task at hand, the present moment, and in that way it’s very similar to a meditation practice. Everyone needs a break, after all, and your mind is no different. Creating something with your own hands is a rewarding experience that few can describe. And, if you keep completing projects, you’ll be able to watch your progress as you turn from novice to expert. The process will give you a feel of accomplishment, boosting your confidence in yourself and your abilities. Even more, you’re focusing on positive experiences and emotions, instead of negative ones. Art doesn’t have to be a solo activity. By participating in art classes or workshops, you can make friends and interact with people. Socialization is proven to help those with mental health issues, giving them a sense of belonging and a supportive group they can turn to in times of need. Here at Creative Ventures Gallery, we believe that the creative process enriches all lives. So, if you’re struggling with mental health issues, sign up for one of our classes or workshops and see how art can be a positive force in your life. Artist/Gallery split will be 75/25. Click the link below for the form to fill out. How did you hear about Creative Ventures?